This is Andy Graham, the HoboTraveler.com, I am back. I spent the last couple of weeks in Les Cayes, Haiti and Mr. Hidalgo returned from Havana, Cuba to Port-au-Prince, Haiti yesterday on an Aero Caribbean fight, I came from Les Cayes by land; we met at the hotel and have been blabbing away in a mixture of French and Spanish. I find it humorous, by land or plane; it still took both of us about 10 hours of sitting on our butts to arrive in the same location. 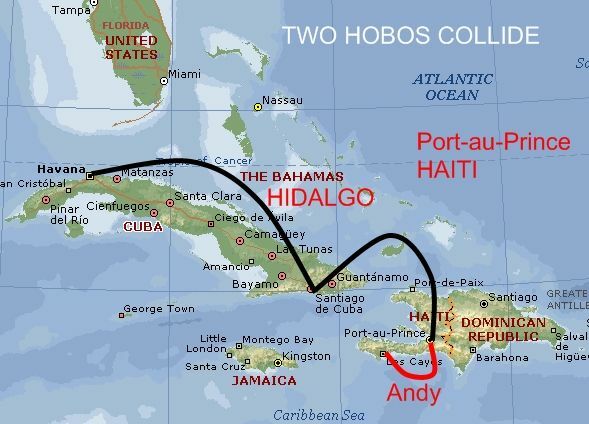 Map of how we returned to Port-au-Prince. I have returned to my same Hotel, called the Executif in the center of Port-au-Prince. This is truly a hotel in the middle of Haiti, no way to avoid being up close and personal with the people. As I tramped my way up the hill towards the Hotel, I needed to stop and say hello to at least 10 people, Port-au-Prince was happy to have the Hobo back from Les Cayes. I am going to work up the Newsletter, publish all the photos for on the internet here for 50 cents per hour, not the 0 dollars of Cuba. Me and Boy Genius from India have devised a way to digest the Travel Journal post and send out the newsletter to the 11,000 readers easier. Therefore, I hope to resume the newsletter and give you the photos in the newsletter and not just selected ones. It is nice to have the computer and camera back in my Hobo hands; I have been using my Verizon htc Touch Pro II, it has great global access, but not the same as a computer. Mr. Hidalgo made a few videos, we will try to get them published, and he is flying to Bogota, Colombia soon. We are both expecting many nasty comments on his Cuban post. Funny, people who love a country like Cuba, do not ever want anything but love written, when the slowly discover the Travel post over time; they can make some nasty comments. Truly, readers do not want freedom of speech, somewhat ironic to me.